Where else can you send fruit in the mail?! The postal system here blows my mind. Granted we are on a fairly small island but come on! The express delivery services aren't that expensive and you can even send stuff that needs to be kept frozen or cool (ever seen one of the kuroneko "cool" trucks?). The beau's parents send us a huge crate of apples from the prefecture where they live every winter that has three layers of different apples. They always fill our apartment with an overpowering apple smell but at normally 2-3 bucks a pop, you'd be happy too! 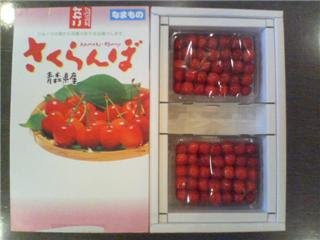 This summer for the first time, we got cherries. They arrived this morning and are just as perfect as I imagined. As with the apples in winter, we now have to embark on a mad cherry-eating frenzy so that they don't go to waste. Just look at these gleaming beauties! I may have to get domestic and learn how to make cherry pie. Fruit in Japan is somewhat of a delicacy and not just the 100 dollar melons. 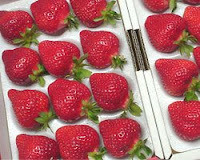 Unless you go to a small neighbourhood produce shop or stall, the fruit is generally hand-picked and wrapped like newborn babes in all manner of cellophane and foam nets. There is no digging through bountiful mounds of apples, oranges and peaches. No, you buy your fruit individually here and it has already been picked out, flawless and free from bruises, and packaged (with the exception of bananas which is because they come from some poor country in the southern hemisphere). I can be a bit of a food nut when it comes to bruises and unidentified holes/pock marks, but this is too much. I can't wait to visit the farmers' market back home this summer so I can revel in all the imperfect fruit-I think I will even make a point of eating all the fruit that is bruised or slightly damaged. The beau brought home two strawberries one night that his customer had given him. 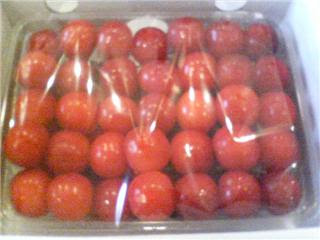 That may sound strange and possibly stingy but in their defence, they were 500 yen (5 bones) each and very voluptuous. They were also individually wrapped in these soft little white covers. Precious isn't it? Japan Post now has a catalogue of food from every region in Japan that can be ordered or sent as gifts. The link will take you to the fruit section but you can get just about anything. I've had meat come in the mail before. Yes, top-quality Japan domestic beef. We had a few points from JAL to use before December last year so we ordered some premium beef from their product catalogue which came frozen and cut into perfect squares, ready to be yakinikued. Mm-Mm! I love the fanaticism with food here! I mean, you can send meat, seafood, fruits and vegetables in the mail! They even encourage it so you don't have to hide it as you might, say, in Canada. Why send someone a gift they will never use when you can send the gift of food? I love it!